Do you work as a sales representative and are not being properly or timely paid your earned sales commission? Has your employer or principal company told you that they were changing the way they calculate your sales commission in order to avoid paying your earned sales commissions? 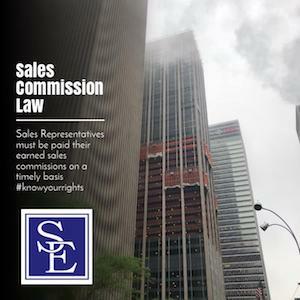 Depending on whether you are an employee or independent sales representative, there are different laws that provide you legal protections to assure you recover your earned sales commissions and ability pursue a livelihood in sales. This article will provide some of the legal rights and common legal issues that sales professionals are often confronted with in the sales industry. The first inquiry in analyzing the legal rights of a sales professional is to determine whether the relationship with your company is one of employee/employer or independent contractor/principal. In some circumstances, the actual legal relationship may be different than what you or the company say or perceive it to be under the law. In other words, just because the company says you are an employee, does not necessarily that you are under the law.. Instead, there are many different factors that Courts will consider in determining whether an individual is an employee or an independent contractor under the law. The application of the factors is very fact specific. The paramount factor utilized in the Court’s determination is the extent of control that the employer maintains over the person’s day to day work activities. The so-called “right-to-control test” is given the most weight. The right-to-control test seeks to determine who has the right to control the means and manner by which work is performed. Other factors include whether the service performed is either outside the usual course of the business for which such service is performed, whether the service is performed outside of all the places of business of the enterprise of which it is performed, and the whether the individual is customarily engaged in an independently established trade, occupation, profession or business. It is presumed that a person is an employee unless the company can satisfy its burden to show that the individual does not meet the legal test to show he or she is an individual. If you are considered an employee, an employer may not terminate your employment in retaliation for complaining about not being paid earned commissions. The New Jersey Conscientious Employee Protection Act (“whistleblower”) (CEPA) makes it unlawful for an employer to take adverse employment action against an employee who discloses or objects to certain actions that the employee reasonably believes are either illegal or in violation of public policy. Even an employee who complains erroneously is still protected by CEPA if the employee can prove that their belief in the violation was objectively reasonable. At least one court of law has allowed an employee to bring a CEPA whistleblower lawsuit against an employer for terminating the employee for complaining about not being paid unpaid sales commission. In DiPaolo v. AM Conservation Group, the employer hired the plaintiff for a sales/administration position and promised to pay her a salary and commission based upon a percentage of sales. After the employer failed to pay the plaintiff her earned commissions, she began complaining internally without success. Eventually, the plaintiff informed her employer that she met with an attorney concerning these wage violations. When the plaintiff advised her employer that she met with an attorney, the employer paid her the outstanding commission payments and terminated her employment. Despite the plaintiff being paid all her earned commissions, the court concluded that she had brought her claims for unlawful termination under CEPA. In concluding that the employee’s complaints of wage violations implicate a public harm, the Court noted that the New Jersey’s Wage and Hour Law is a humanitarian law, serving as remedial legislation which is to be construed generously so as to fulfill the Legislature’s intent. If you are not an employee, but rather an independent contractor, your claim for unpaid sales commissions may be limited to the penalties provided under the New Jersey Independent Sales Representatives Act. While you may have not the same job protections that an employee may have in terms of whistleblower retaliation, New Jersey law provides independent sales representative strong protections to recover unpaid earned sales commissions. For example, the Independent Sales Representatives Act provides for recovery of not just the sum of the earned but unpaid sales commission, but also provides for an additional penalty of treble damages which is calculated as 3 times the sum of the unpaid sales commission, the Independent Sales Representative Act also provides for reimbursement of all attorney fees and costs incurred in bringing the claim under the act. If you are an employee, and your sales commissions are considered “wages”, the failure to pay the sales commissions timely could subject the company to the dictates of the New Jersey Wage Payment Law. The New Jersey Wage Payment Law requires that employees be told at the time of their hiring what their rate of pay will be and on what day they will be regularly paid their earned wages. New Jersey Wage Payment law defines “wages” as the direct monetary compensation for labor or services rendered by an employee, where the amount is determined on a time, task, piece, or commission basis excluding any form of supplementary incentives and bonuses which are calculated independently of regular wages and paid in addition thereto. The New Jersey Wage Payment Law also requires employers to pay all wages due not later than the regular payday when the employer terminates the employee’s employment. Finally, an employer cannot enter into or make any agreement with any employee for the payment of wages of any such employee that would be in violation of New Wage Payment Law. This means that if your commissions are not paid as a form of supplementary incentive or bonus, your employer must pay you the sales commissions timely. If they do not, they will be in violation of the New Jersey Payment Law. A company’s failure to pay an employee or independent sales representative his or her earned sales commissions may amount to a claim for breach of contract. A contract is formed where the essential terms of the agreement have been communicated between two or more parties and there has been mutual assent to those terms. Contracts have been often called “a meeting of the minds”, which is evidenced by both sides expressly agreeing to every term of the contract. When a company breaches its agreement to pay a certain amount by a certain date, a sales representative can seek the damages sustained by the breach of contract. If you are an employee and are terminated by your employer through no fault of your own, you will be entitled to claim unemployment benefits while you look to secure new work. An employee is also eligible for unemployment benefits if they voluntarily leave their job with good cause. If you are not an employee, but instead an independent sales representative, you will not be able to collect unemployment benefits, at least initially. There are limited circumstances when an independent sales representative can collect unemployment benefits, which may include the formal closing down of the independent sales representative’s business. The New Jersey Wage and Hour Law and the federal Fair Labor Standards Act allow employers to be exempted from having to pay outside sales persons any overtime pay for hours worked over 40 hours a week. An employee is considered an outside sales employee for purposes of the overtime exemptions of New Jersey and federal wage law is when (1) the employee’s primary duty is obtaining orders or contracts for services or for the use of facilities for which a consideration will be paid by the client or customer and (2) the employee customarily and regularly engages away from the employer’s place of business. The minimum salary requirements of the administrative, professional or executive exemptions of overtime pay do not apply to the outside sales exemption. Under the outside sales exemption, the term “primary duty” is defined as the principal, main, major or most important duty that the employee performs. The term “making sales” includes any sales, exchange, contract to sell, consignment for sales, shipment for sales or other disposition. A sales professional “obtains orders… for the use of facilities” when he or she sells time on radio or television, solicits advertising for newspapers and solicits freight of railroad and other transportation companies. “Customarily and regularly” is defined as greater than occasional but less than constant. Whether a sales professional meets the outside sales professional exemption is a fact sensitive inquiry based upon the duties and responsibilities of the sales professional. It may be unlawful for an employer to terminate a sales representative solely to avoid having to pay a bonus that would otherwise need to be paid to the employee. If a sales representative has a contract with his or her employer that entitles them to a bonus or other additional compensation, the contract has an implied covenant of good faith and fair dealing. In an employee-employer relationship, a claim of breach of the implied covenant of good faith and fair dealing will exist if the employer terminates the sales representative in bad faith to deprive him or her of the benefits of the employment agreement, including the bonus. In these situations, the sales representative would have to show that there was no good reason to terminate their employment other than to avoid having to pay the bonus that would have had to been paid if the employer did not breach the employment agreement. This is not, nor is it meant to be an exhaustive list of laws relevant to the life of a sales representative and their potential claim for unpaid commissions. Other legal remedies can include claims of promissory estoppel, unjust enrichment, fraud and others. 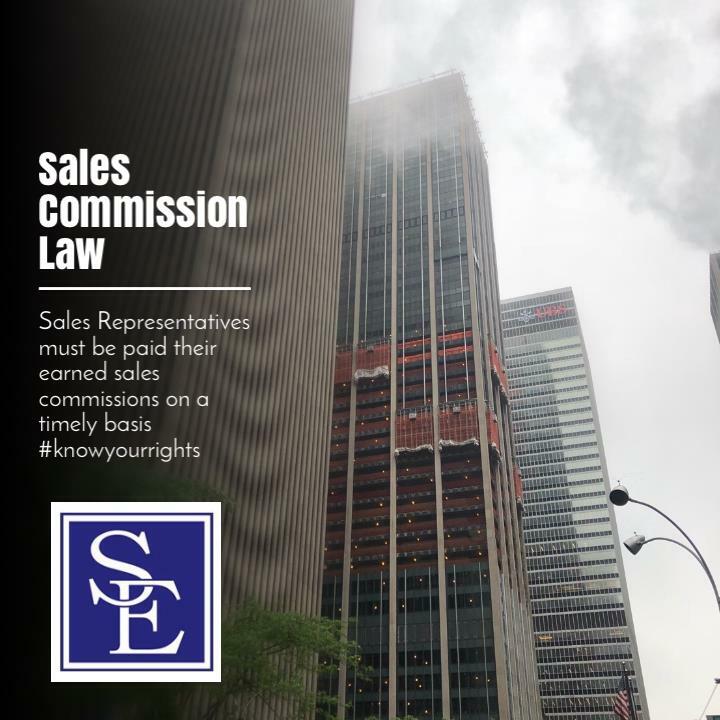 If you believe your rights as a sales representative are being violated, it is important to have an experienced Sales Commission Lawyer review the specific facts and circumstances of your situation so that he or she can properly evaluate all potential claims. If you would like to speak to one of our New Jersey Employment Lawyers or Sales Commissions Lawyers, please feel free to contact us at our Holmdel, New Jersey law offices.